Searching for a quality auto shop can be a daunting task, especially with the stigma of overpricing and under-repairing hanging over the independent auto repair industry. One way to ensure that you end up at a trustworthy shop is to check online reviews to find out about the experiences that past and current customers have had. At Hye-Tech Auto Repair excellent customer service is a main priority of ours, as is expert car care, as reflected in our customers' reviews. With 100 reviews on Yelp and we've maintained a 5 star rating! So the next time you need auto repair in Covina we hope you take your friends and neighbors recommendation and come see us! John is a great and honest guy with a wonderful attitude, he is not trying to take an advantage of people and to charge more than the labour actually costs like other mechanics do, in the contrary he gave me a discount for the spark plug replacement, and did the job very rapidly. Thanks again, John. - Sergey K.
Such wonderful and HONEST people! Even shopped around for best prices on parts. Went the extra mile to be sure I make it back to Arizona. Thanks Everyone! And what a great price for all the work done! - Sevan K.
Friendly, upfront and honest. Great customer service! I would highly recommend anyone to this location for repairs. Thanks john for everything. - Jake H.
If you are reading this and looking for a place to bring your car... look no further.. I started going to John because of reviews I had read.. and they all praised him to an amazing degree.. That's what I am doing now.. because they ARE that good there.. I have never had a problem and I have been to Hye Tech a few times... he has kept my 2003 Ford Focus with 120,000 miles on it going like clockwork. - Declan G.
Always great service. Friendly and very reasonable prices. John is the best and I recommend Hye Tech Auto to all my friends and family. - Melissa O. Very honest and professional shop, pricing was considerably less the the dealer even with original parts. Everything was explained to me properly which I appreciate. I would highly recommend John and his staff for any car repairs my friends or family may need. - Steve A. As you can see we take customer service serious! 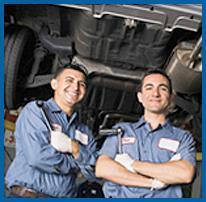 When you're in need of professional auto repair in Covina come visit our friendly team! To learn more about our auto repair services or to request an estimate for expert service give us a call at (626) 332-5452 today!